I've found that sonic changes in an interconnect cable are subtle, but worthwhile. They won't bang you over the head, but may make slight changes in warmth, bass, treble, etc. I find that headphone recables actually make a larger difference, especially with headphones like Sennheiser or Denon. In seven or so years of experimenting with interconnects, I've settled with Cardas wire for most applications because of it's perceived warmth. Warmth is an audiophile term that means a slightly rolled off treble, not really in the pursuit of accuracy but more pleasing sounding music. My ears tend to be sensitive and a little bit more warmth goes a long way, it can help me listen longer before fatigue sets in, and can warm up the treble on a headphone that would otherwise be difficult to listen to (think Beyerdynamic DT990 / 250 ohm). 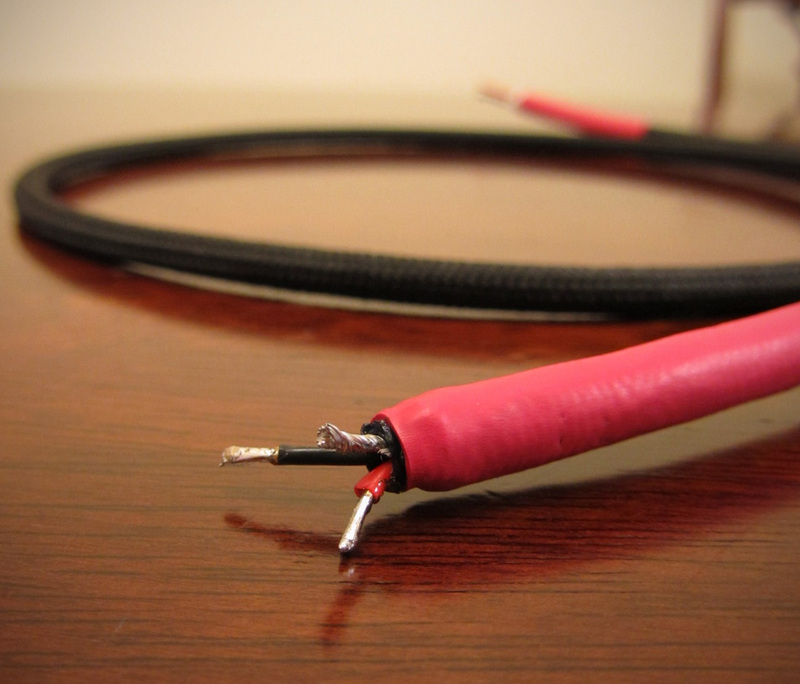 This may be attributable to the individually enameled strands, so when you have multiple strands of differing gauges all isolated from one another, the slight difference between the signal in all these strands over the length of the cable causes a slight smearing effect which the human ear may perceive as warmth. Just a guess on my part, but it seems logical. So I picked up some Cardas 21.5 x 2 interconnect / hook up wire. I choose this over the similarly priced Crosslink because it offers the internally litzed copper and less capacitance (21.5 gauge versus 17.5 gauge). It's also nicer to run internally as signal wire as it's not as thick. 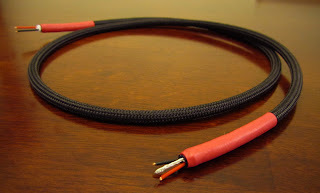 I suppose if you visually like the thicker cables, you may want to go with the Crosslink ;) I also picked up two pair of Cardas GRMO, which is their silver and rhodium plated RCA, similar to their top-line SRCA but a little less expensive and sheds the spring-loaded ground connector. The Cardas 21.5 x 2 is obviously two 21.5 gauge conductors, a signal and return, and a woven shield with cotton spacing. It's a handsome navy blue, but I'm going to cover it up with some Techflex soft black nylon multifilament to give it a little more character. The Cardas RCAs are unique in that, aside from being pretty, they don't have a strain relief. You have to craft one yourself with heatshrink. 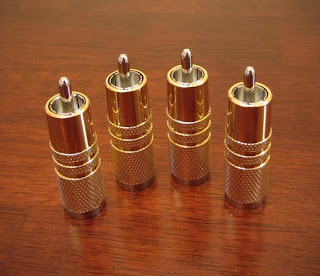 They also require quite a bit of heat to get the solder to stick to that rhodium plating. 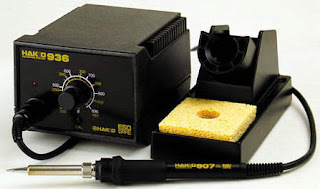 You pretty much have to have an adjustable soldering station to work with Cardas wire and connectors. If you don't already have one, the Hakko 936 is an incredible value (~$85) and provides the heat you need. 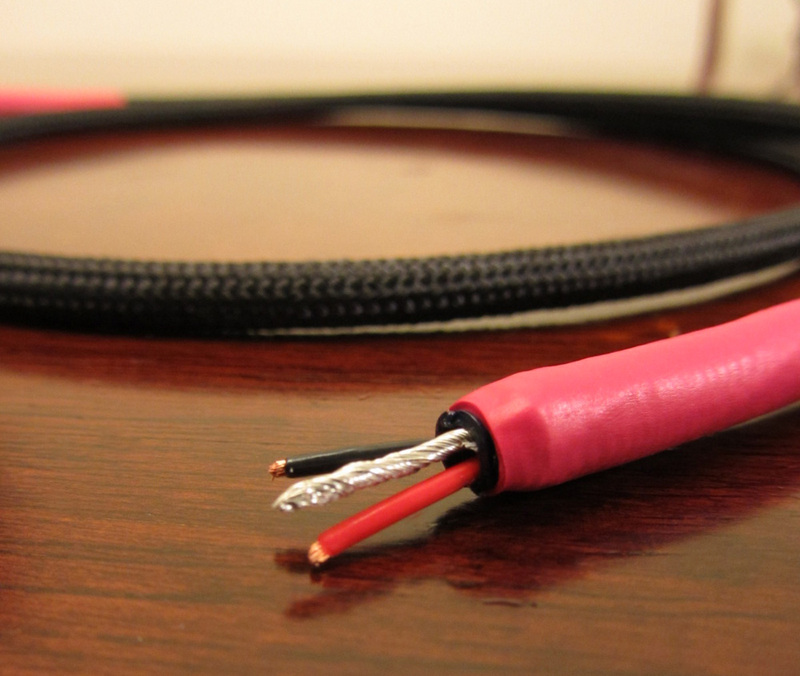 So the first step I performed was to sleeve the wire with the Teckflex nylon multifilament sleeving. This is a soft feeling sleeve that has a vintage look to it, almost like the waxed cotton you'd find so typically on 50s and 60s electronics. It does fray if you're not careful, so be wary not to snag it. I used 3/16" for this application and trimmed it down with a hot knife. I used a pair of runs of 1/4" red heatshrink and a heatgun to shrink them to fit. 1/4" is very snug, so 3/8" can also be used. This will be the right interconnect of the set, which is always labelled with red. I will be configuring these ICs with a floating shield, so the shield is twisted up on the source side and trimmed away on the other. Cardas interconnect wire always has little arrows for directionality, it may have something to do with the direction the copper was drawn, and I'm honestly not sure that it even matters, but I always ensure that the arrow is facing the end without the shield connection. The wire now has to be stripped and "tinned". Tinning simply means that you cover it with solder. Cardas wire is enamelled, so I turned my iron all the way up, and burned the enamel off while simultaneously tinning the tips. I clean the iron tip after each tinned wire to get the enamel off. This process can also be achieved with a solder pot. As stated previously, the Cardas RCAs require quite a bit of heat for the solder to melt on them and achieve a strong joint. If one is too cursory with this process, the joint will break off pretty easily. The RCAs will be piping hot after they have been soldered, and will burn like hell if you touch them ;) Once the RCAs have been given time to cool, some adhesive 3:1 1/2" heatshrink is slipped over top and shrunk in place. This will act as a strain relief. 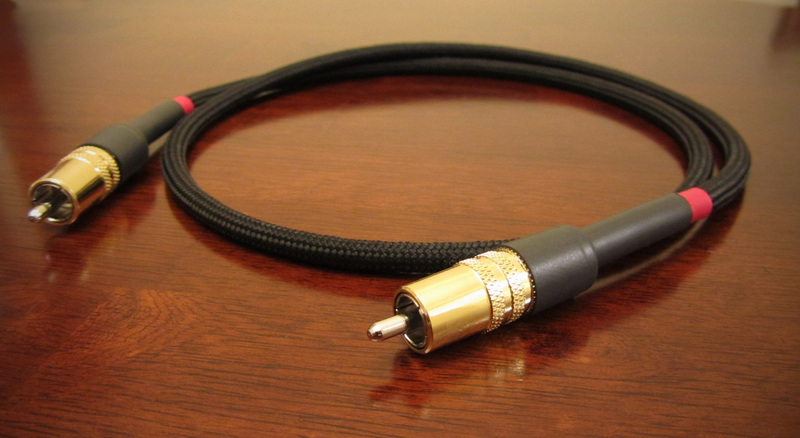 So without much labor, we have a nice Cardas RCA interconnect. 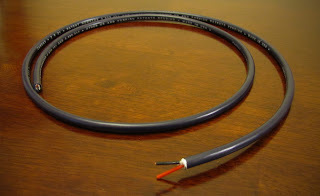 If you'd like an interconnect like this, or something completely custom, contact Zynsonix for a great sounding solution. The above steps detailing the building of a cable are for entertainment purposes only, and not to be performed under any circumstances. The owner of this blog and all associated parties can not / will not be held responsible if you attempt the process posted and cause physical harm to yourself, your surroundings or your property. Please keep this in mind. I freaking LOVE this blog btw, your work is outstanding. Out of curiosity (please don't flame me, I'm new to this), The Cardas cable has 2 wires, a positive and a negative. You have created a 3rd with the shield (on the one side). Do you simply solder the shield to the same place as the negative on the one side? Thanks Matt :) You're absolutely correct. For the floating shield configuration the shield is connected to the negative (aka return) on the source side and not connected to anything on the other side. It's a good idea to label the directionality after you do this (e.g. make a little arrow) so you know which direction to install the interconnects when they're done. Dumb Question: In regards to connecting the ground wire to shield on one side, what is considered the "source" side of the cable? Between an amp and preamp would the source side be the preamp? Awesome :), I was looking everywhere online before I was going to ask you... I couldn't find a similar configuration for DIY. It was driving me nuts. I can't wait to make a pair!!!!! Great blog that is really helpful! I've been looking everywhere for 3/16 techflex but can't seem to find it sold by the foot. Will 1/4 Techflex work ok? The 3/16" nylon multifilament is what was used above, the sizing on regular techflex is quite different since it expands, whereas the nylon does not. I'd imagine 1/8" Flexo PET would be able to expand enough to slip over thinner interconnects. 1/4" would likely work too but might be a little large. An excellent DIY article. I've made two pairs of these so far and their performance is on par with much more expensive interconnects.